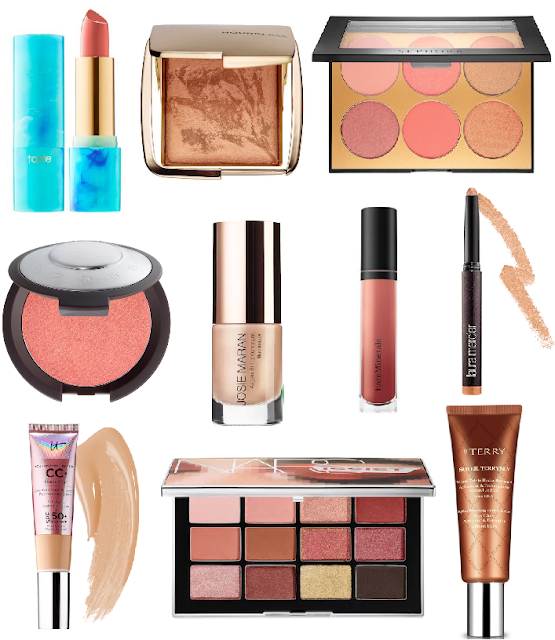 Rosy Outlook: My Favorite Beauty Products for Summer! My Favorite Beauty Products for Summer! Happy Monday loves! Hope you had a great weekend. This weekend was a busy one! We continued packing up our place and also are doing a couple things around the house to make it ready for new renters. We also had my cousin's graduation party on Sunday which was fun but unfortunately the weather just sucked--super rainy and humid. I am so ready for sunnier days around here. Maybe it will rain less in Boston?! We'll see! I get WAY more excited about make-up and beauty products during the spring and summertime because my skin FINALLY starts to look good and feel normal for once. I have eczema and pretty dry skin all over my body including my face so make-up never wears quite like I want it to during fall and winter. During summer I feel like a whole new woman! I go for SUPER glowy, natural skin during the warmer season. Glowy + sheer CC cream, shimmery bronzer, liquid or cream highlighter and blush that has some sort of shimmer or sheen! Basically the goal is to look sweaty all the time haha. You look so lovely!! And have the best make-up, I love how everything has a summer vibe to it, bronzy and beautiful! All of these look so pretty and "glow-y"! Making a trip to Ulta soon and will have to investigate these! Excuse me while I run to scoop up ALL of this. Your makeup always looks so flawless girl. I definitely need to try that bronze serum! Love the lipstick look, so pretty! I am obsessed with the bare minerals liquid lipsticks.. so amazing! I never tried any of these products before, I have to read more about some of them. In here where I live it also rained for the whole Sunday, but at least it was not so extremely hot anymore. You look absolutely beautiful! I've been hearing a lot of great things about a lot of these brands and products. I've been meaning to test out a lippie from that Tarte line because I suffer from intense dry, cracked lips and it sounds so moisturizing. I've also wanted to try an Hourglass blush and highlight, too. Their packaging is reason enough, lol. Thanks for sharing and I hope you have a great week! STOP IT!! So gorge! In love with that lip color!! Too true such a fun excuse to look glowy! That Laura Mercier hight lighter is excellent and is on my must have list. Great list dear. I've heard a lot of good things about IT CC cream, and I've always wanted to try it. Thanks for the reminder. Anyway, you look amazing dear!